Rare collectible posters and film posters are the collector’s delight at Puces de Paris - Saint-Ouen. Les Puces, a wonderful urban flea market located in Saint Ouen, Northern Paris, is a paradise for bargain hunters browsing through the different markets in search of that rare piece that will enrich their collection. Original posters, movie posters, there is a little bit of something for everyone here, but you need to take your time to look for specialty shops and chat with the stall-holders to find that rare item. Shops located on the first floor of Dauphine market offer original posters on various themes. Movie poster collectors are invited to make sure that they don’t miss booth 189, allée Gauguin: it offers rare documents on the art of cinema such as old postcards, photographs and movie posters of French classics. 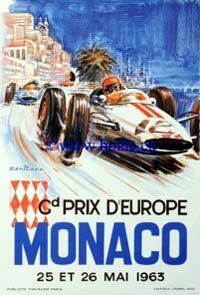 Further down on allée Gauguin at N° 207, you will find sumptuous original posters of the French airmail service, Air France posters or the first editions of Grand Prix de Monaco posters. A collection of vintage, original or rare posters can be really expensive! Finally, do not leave Dauphine market without taking a look at the large bookstore at booth N°215 and the nearby smaller comic bookstore at booth N° 241. You might find posters here in addition to the numerous comics and the Tintin figurines on show. Dauphine market does not showcase all vintage posters: you must go take a look at the other markets to find that rare item. For example, you can meet Stephane Aunon and discover his fine collections of film posters at booth 106, allée 2 in Jules Vallés market. You will also find a large collection of vintage posters at Paul Maurel gallery (allée 1 / booth 41): this place offers different styles of posters dating from the end of the 19th century to the 1950's but also litographies and geographical maps from 1820 to 1890. The Biron market also offers original old posters: walk down the allée 1, n° 1 & 129 galleries but also stop by Jane Moufflet and Posters Paris galleries specialized in rare posters from the 19th century to the middle of the 20th century. Discover different styles (Belle Epoque, Art Nouveau, Art Déco, Modernism, Contemporary) and objetcs (food, drinks, shows, sports, travel...).